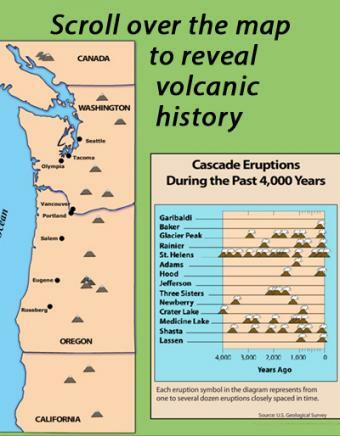 The Pacific Northwest is a volcanological wonderland. 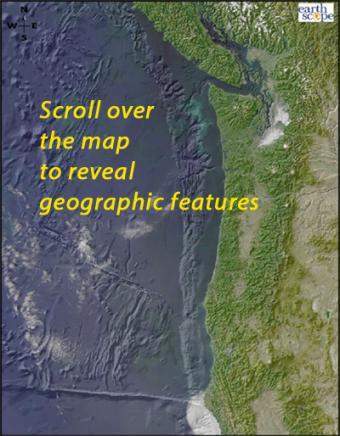 The western margin of North America has long been dominated by subduction and dextral transtension. Ocean-ridge rifting produces submarine volcanism offshore. 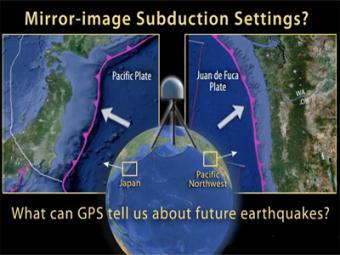 Subduction of the young Juan de Fuca Plate creates the arc of Cascades volcanoes. 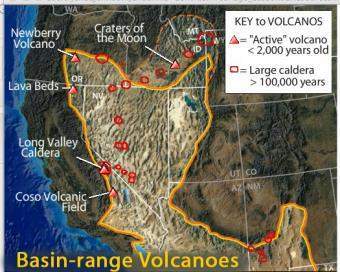 Hot-spot volcanism drives the Yellowstone caldera system. Continental extension of the Basin and Range province, plus a northward migrating triple junction add to a complex volcanic history. 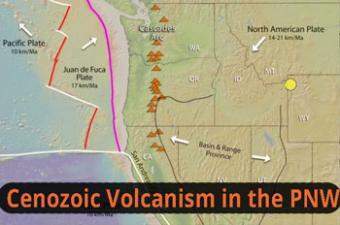 Using map view in concert with cross sections, this animation steps the viewer through both volcanic and simplified tetonic processes. This interactive map of the Basin-Range Province reveals information about the youngest volcanic features associated with the region. 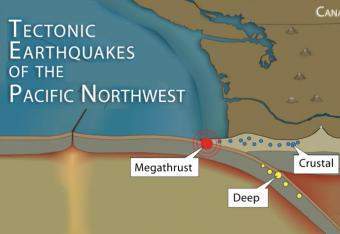 It is common knowledge that the Pacific Northwest can expect a subduction-zone megathrust earthquake in the future. But did you know that there are other types of damaging earthquakes. 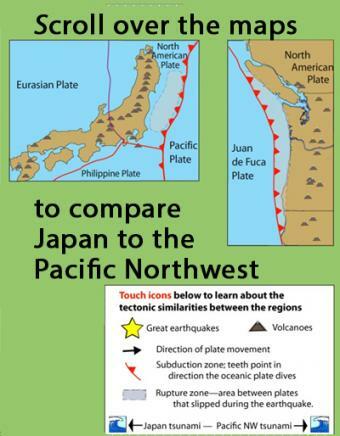 This animation uses analogies and cartoon block diagrams to teach about the three types of earthquakes. 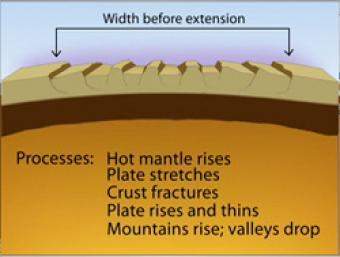 During Basin & Range extension, the plates pull apart, the mantle rises and melts due to lower pressures near the surface. 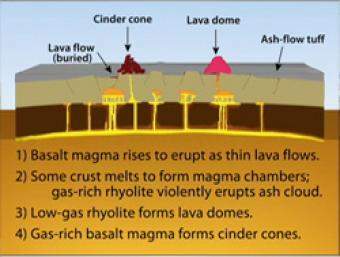 The style of eruption depends on how long the magma sits in the crust and undergoes processes such as crystallization and melting and assimilation of wall rock. Over most of the last 30 million years, movement of hot mantle beneath the region caused the surface to dome up and then partially collapse under its own weight, as it pulled apart. 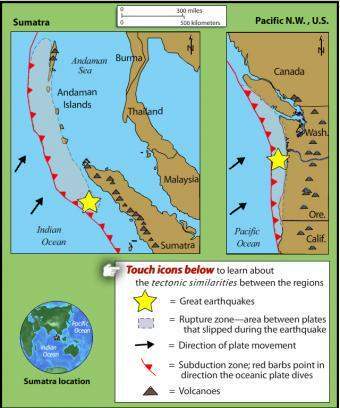 Currently, there is very little actual stretching going on, and the small amount is concentrated on the Western and Eastern edges of the Basin and Range.